season each year. The beautiful sunsets, fabulous food and almost daily entertainment found on the Terrace are staples of a Madison summer. 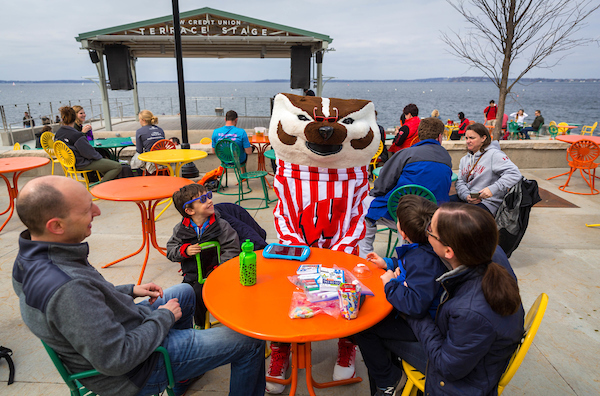 The 2016 and 2017 Terrace seasons included everyone’s favorite Terrace traditions along with many new services and activities. For example, new to the Terrace was the Terrace Welcome Cart. The cart was created to provide members and guests with a more personalized Terrace experience. While the Welcome Cart is an informational checkpoint for Terracegoers, it is also a place for the Union’s membership team to get to know Union members. Opposite from the Welcome Cart location, on the east side of the Terrace, sits one of the newest additions to Union dining – the BBQ Stand. members yet another location to pick up their favorite flavors of Babcock Ice Cream. Along with additional hospitality and dining options, daytime programming on the Terrace has expanded, including new music programs, craft-making activities and games. For example, a variety of board games became available in summer 2016 for free use on a first-come firstserved basis at the Welcome Cart, including family favorites such as Scrabble, Monopoly and Sequence. A new classical music series, Summer Serenades, has also become popular on Sunday afternoons at the Terrace. This series features classical music artists from the Madison area. Along with additional daytime entertainment, Memorial Union’s in-house art studio, Wheelhouse Studios, frequently hosts Wheelhouse on Wheels – a drop-in art program that takes place Wednesdays on the Terrace. Wheelhouse on Wheels debuted June 15, 2016, with the opportunity for guests to create and decorate bubble wands. Since then, projects, such as hat-decorating, keepsake boxes and henna tattoos, have been favorites on the Terrace. While outdoor rental options, such as kayaks, canoes and stand-up paddleboards returned, early this summer, the Union team welcomed the newest addition to paddle rentals, called SUPSquatch, an eight-person stand-up paddleboard. The giant paddleboard has been a smash hit and has been seen traveling around Lake Mendota all summer long. even more exciting. Visit TerraceSummer.com to plan your Terrace season.